Day You Were Born Gifts. What happened the day you were born? 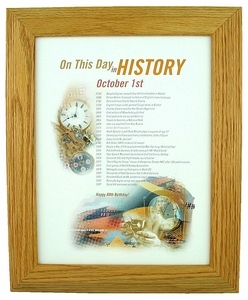 This day you were born print makes a fabulous gift marking your special event from the past. 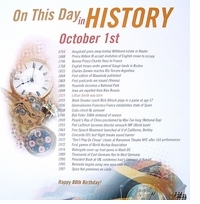 This attractive color day you were born print lists 23 important events that occurred on a particular day throughout history. For example, if the day you were born is February 11th, it lists 23 events that occurred throughout time on that date. This personalized print can be created for a birthday, anniversary, start of a business, OR ANY EVENT YOU SPECIFY! Same as above but in a black frame.